As a Tech-Net Professional Auto Service center, at Nott's Automotive in Sarasota you have access to a wide range of benefits when you choose us. 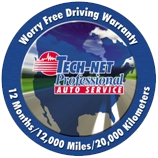 Tech-Net provides warranties on parts and services received through us, meaning if you get into a sticky situation with your car, truck, or SUV, you’re covered. And, since Tech-Net centers are nationwide, you have access to warrantied repair at any Tech-Net service station. Furthermore, after you’ve spent $25 or more on any Tech-Net service, you’ll have access to roadside assistance in the event of a flat tire, dead battery, vehicle lockout, or other emergency. There are plenty of mechanics out there; but if you want reliable parts, excellent service, professional technicians, and guaranteed products, be sure you choose Nott's Automotive in Sarasota for all your vehicle maintenance and repair needs. We’ll be here when you need us.